Welcome to the 267th Tablescape Thursday! A couple of weeks ago I shared this picture from Country Living online. 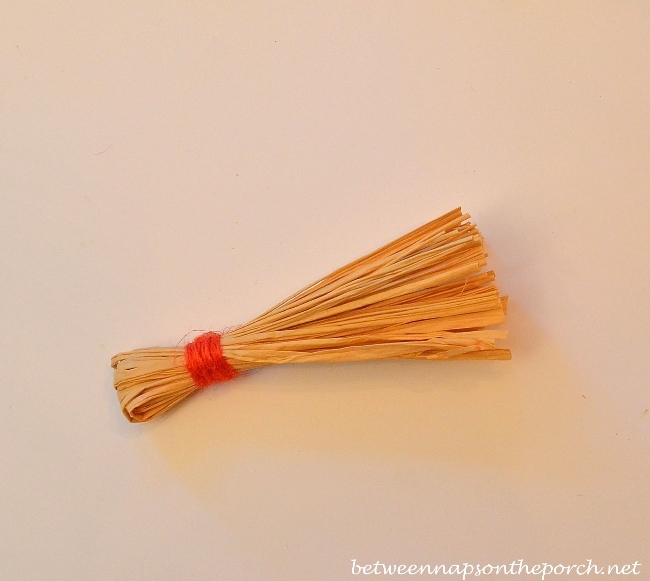 I thought it would be fun to make some of these broomstick place card holders. I didn’t see a tutorial for them at CL but they looked pretty easy to make, and they are! 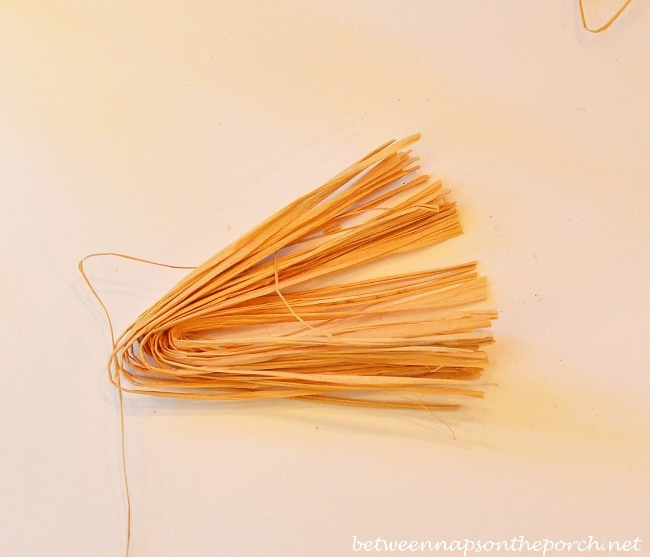 To make broomstick place card holders, you’ll need raffia, yarn or jute thread in any color you prefer, Fabri-tac or a glue gun, sticks from candy apples (bought mine at Publix) or some little twigs from your yard, wood stain, scissors and paper or card stock. …once again (just for you) I suffered through a bunch of candy apples to get the broom handles for this project. 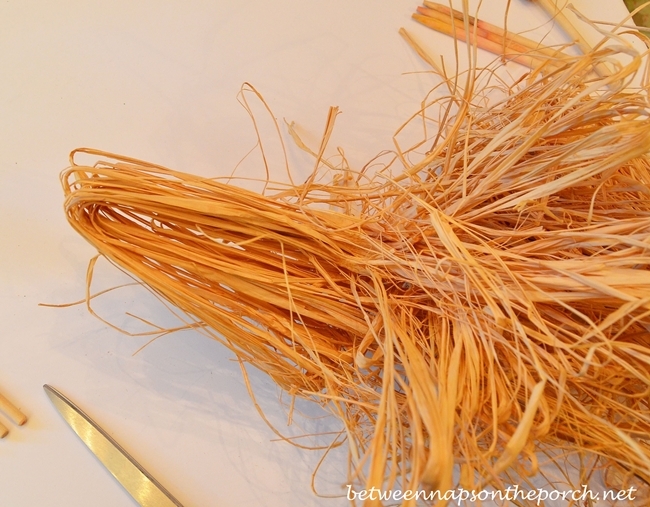 The raffia I had on hand came wrapped basically like a skein of yarn, so I just took a clump from one end where it was naturally bent and cut off a section that looked about right for the bristle end of the broom. Here’s how it looked, once cut. 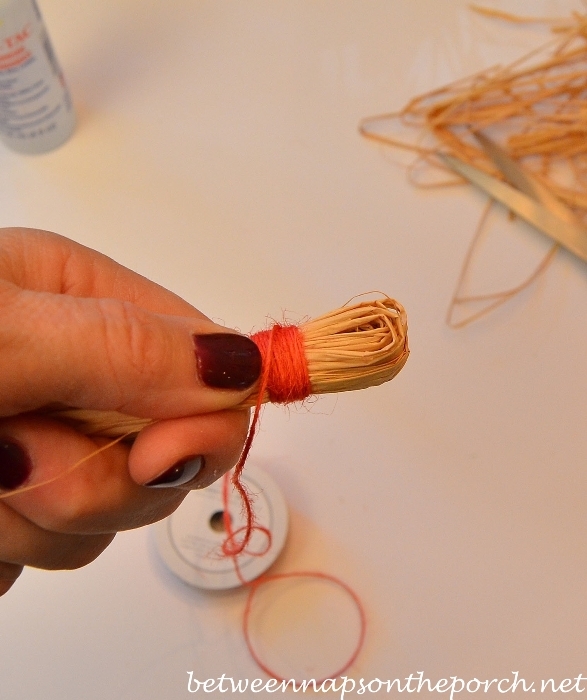 Next, just hold all the bristles tightly together in your hand and start wrapping your yarn or jute thread around and around the top/non-cut edge, starting about 3/4 to 1 inch down, as shown below. 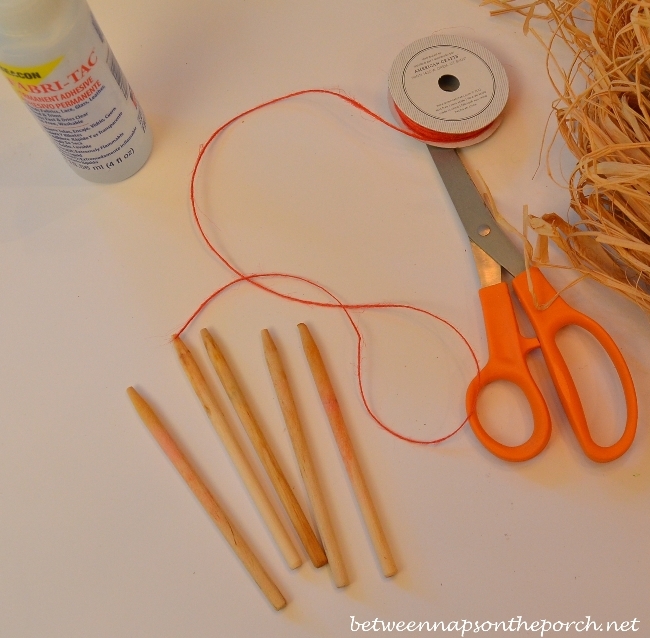 Once you have the yarn wrapped around and looking the way you want it to look, go ahead and tie it off. I also added a drop of the Fabri-tac glue just to make sure the string didn’t come untied later. 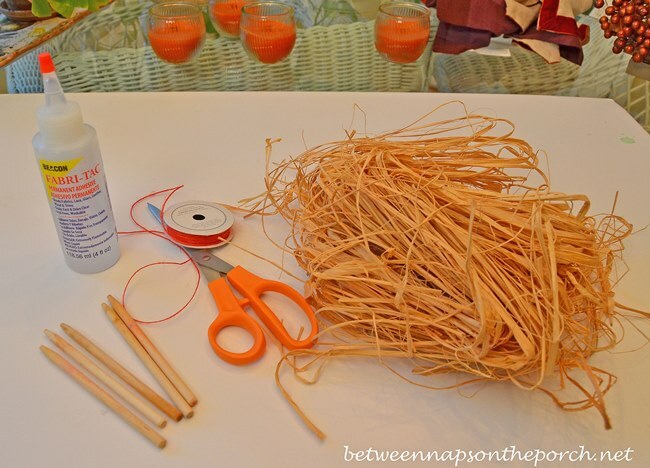 Next, find a good spot in the top to spread the raffia apart a little and poke the pointed end of the candy apple stick down inside the raffia about an inch. If it feels like it will easily come back out, just add a drop of Fabri-tac or hot glue before inserting it. Before I added any glue, I pulled mine back out and stained them with some dark stain I had on hand. If you’re using twigs, you can skip the staining step. After I finished making my broomstick place card holders, I was trying to decide how I wanted to display the name. I couldn’t remember exactly how it was displayed on the ones I had seen at Country Living so I Googled for them and came across these broomstick place card holders at HGTV here. I liked the way the name was displayed and really liked how they looked standing up, as if they had come to life. 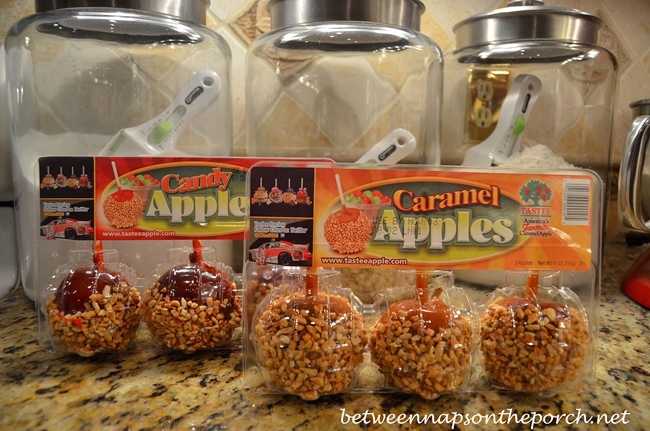 If you don’t want to use the sticks from candy apples, you could just uses little twigs from your yard. I think that’s what they did for these and that looks great, too! To make the little name labels, I used a piece from this card stack that I’ve shared here before at BNOTP. I found it in Michaels last year. 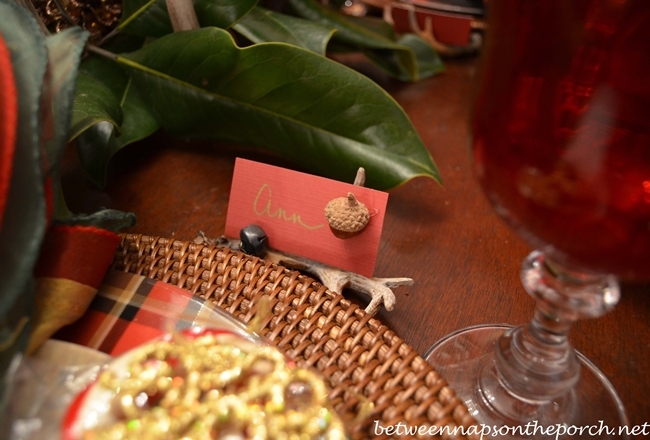 You may remember when I made place cards for a dinner party last winter using a cinnamon red piece from the deck. Here’s how the broomstick place cards turned out. I cut a narrow strip, notched it at the end and used a gold Sharpie to write the name. 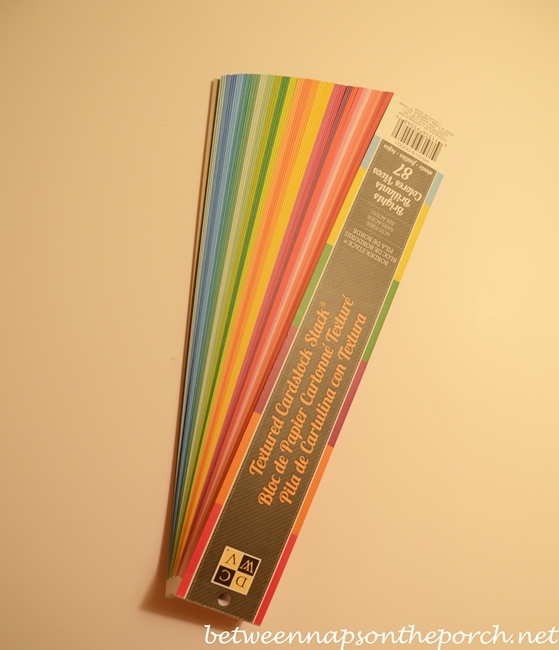 I added a dab of hot glue to the end of the label and wrapped it around the stick near the top. You could even hide the yarn with a bit of ribbon, if you like. Won’t be long now before the ghosts and goblins come calling! These are a very cute idea. Wow Susan those came out so cute! I like them standing up. Great job and a nice tutorial! 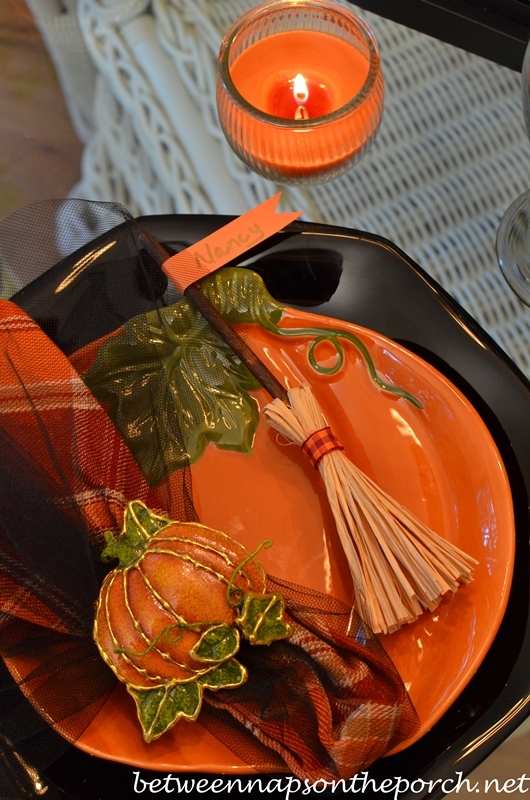 Lovin’ the pretty pumpkin plates! Thank you for hosting this most popular party…Hope you are enjoying this cooler Georgia air…feels like fall for sure! 🙂 Yep, sacrifices must be made! Very fun little project that I will actually do, probably for Thanksgiving. Thanks! Susan, those are adorable. Thank you for sharing. 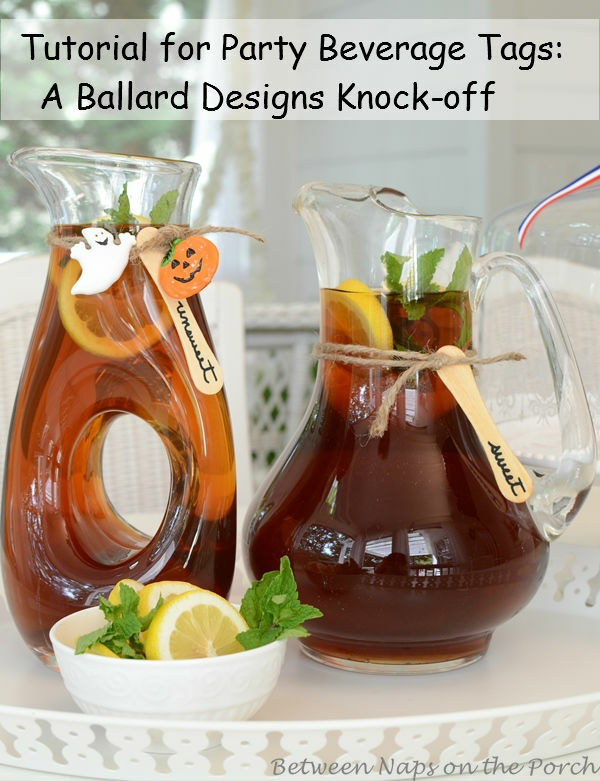 One of these days, I will have a Halloween dinner party and that will be a fun item to add. Love these Susan! Super cute! 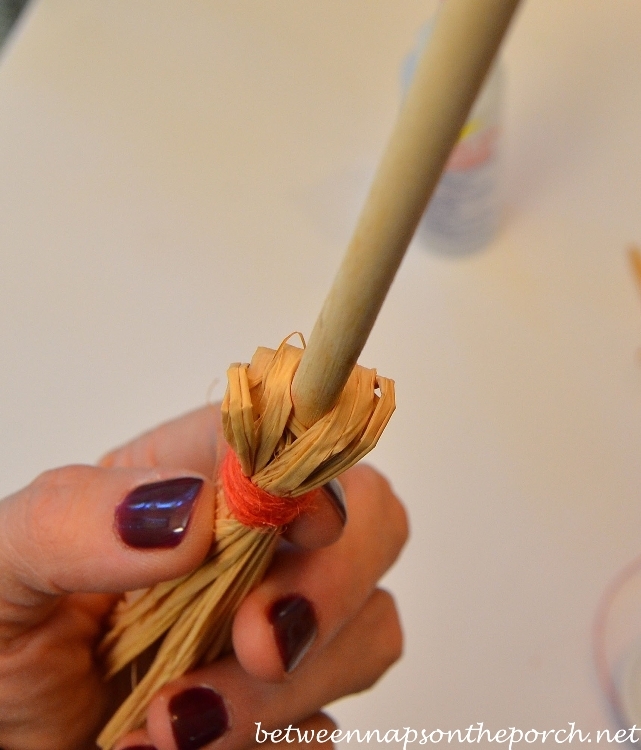 I tried to make brooms out of pretzel sticks and cheese slices and it was much harder than it looked! Next time I’m going for raffia! Thanks for the party and ideas! Adorable! I like them standing up better too! Thanks for hosting, Susan. Love them standing up-they look like they are ready to launch a witch! Thanks so much for showing us how. 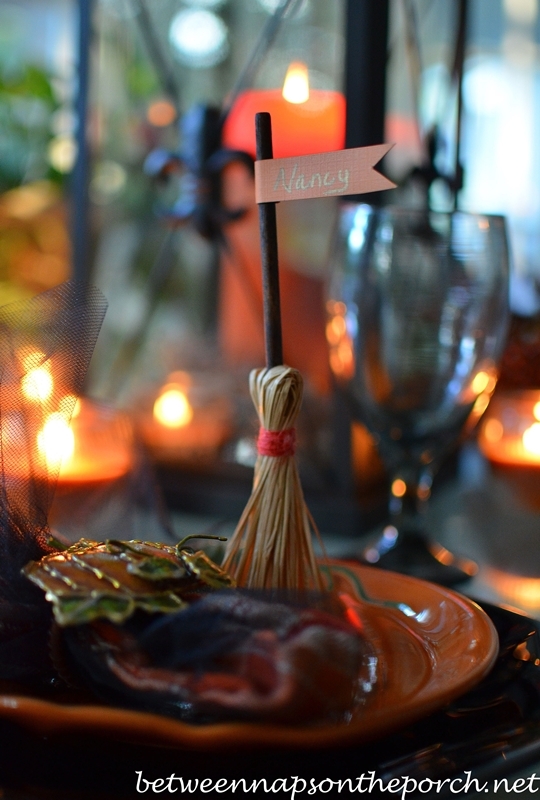 Then broomstick place card holders are very clever! Don’t know what is happening – but I am still not able to open your post on Google Chrome – it keeps coming up as the Garden Frog post. On Explorer, it comes up but will not open. Joni posted me by going through the her blogger dashboard. Seems to be a problem. Joni still can’t bring it up on Explorer and I still can’t bring it up on either. Thought you should know. Jacqueline, what is it that Joni can’t bring up? Jacqueline, let me know if it’s fixed now. My hosting company just corrected something that may have been causing that. Thanks for telling me about it! Susan, a long while back I found your site. At that time the tablescapes were viewed right on your website. I just retired and now have time. I looked forward to enjoying all the photos and now I can’t figure out how to see them or even if the photos still exist. Can u help me? Hi Irene, Sure, down the front of the blog’s home page, you’ll see excerpts of the most recent posts. Just click on the title of the post or the excerpt picture and it will open up and all the pictures I’ve posted should be there. If you’re wishing to view the other tablescapes linked up for that week’s party, just click on the blue frog at the end of the post where it says, “Links in collection: 60, Click to view/add link” and all the links will appear. For this post where you left your comment, I didn’t post a table but instead showed how to make broomstick placecards for a Halloween table setting. 🙂 Yup! They were good, too. I also bought the caramel kind. Yum! Susan, it’s a difficult job being a photo stylist having to consume so many candy apples just to get to the broom sticks. My favorite is the caramel apples too. Your project is adorable. I’m going to remember this one. It’s fun to have unique place setting cards. I need to decide on an idea for Thanksgiving as we are hosting 12 for dinner. They are pretty cute! I love your lanterns on the table too. I forgot to tell you that yesterday when I checked out at Walmart I also bought 2 candy/nut apple. I ate one of them yesterday and it was so-o-o good. I only see them at Haloween so I snatched them up. I will also try the Rustic candle on my next visit. Your place cards are adorable. I can’t wait to read your blog each day. Love it. You know what’s funny is the rustic candle reminds me soooo much of the scent I have smelled when going into homes that were on home tours ac Christmas time. Maybe whatever tour my brain is remembering…maybe they bought their candles at Walmart. That may be another reason I like it so much…it may be triggering that memory of the home tour. You may not like it but I was surprised that I did. Too cute! It’s funny: I had purchased raffia without knowing it comes like a skein of wool, and wouldn’t work for the project I was doing, but now I have something to use it for!! Thanks for the idea!! P.S. For some reason I didn’t get an email alert that your new posting for today’s TT was up. Would you know why? Rosie, I wonder about Google’s Feedburner because the numbers it shows vary wildly. I may have to switch to another email service. I subscribe to just see if it goes out and mine did arrive. It didn’t go out though until 11:00 today since the post didn’t go up until 10:00. Check and see if it’s there now. Also, check you spam file in case it got dumped in there. Will you let me know if you found it? I’m seriously wondering if I should move away from Feedburner to a paid service since I’m not sure how reliable feedburner is at sending out the emails. Hi! Just gorgeous. 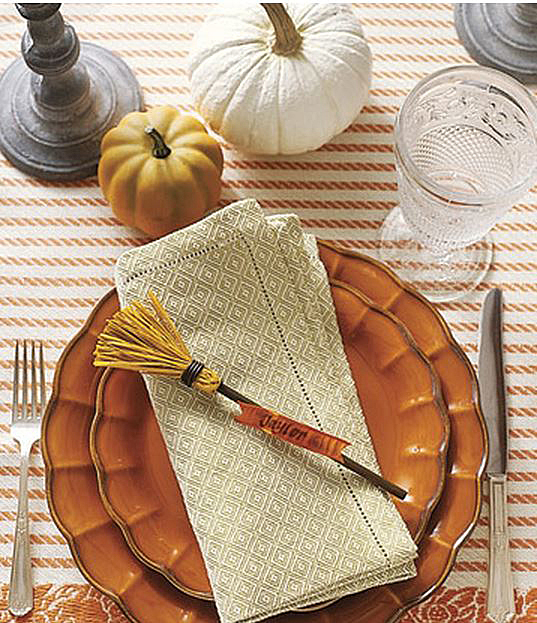 Does anyone know the manufacturer of the pumpkin/orange/rust plates in the top Country Living photo? I’ve looked and looked and can’t seem to find them. Any help would be greatly appreciated. Thanks! Andie, I’m not sure but I love them, too! Such a great color! HI, Was anyone able to find info on the beautiful orange/rust plates listed on Country Living Online with the broomstick placecards? I’m obsessed with these. These are adorable and thanks for taking one for the team!!! Love your tips & tuturial Susan. You really teached me a lot of things around our daily lives. Me & my daughter who is visiting us /sem break from the University had done our cardholders. I will show this off next week, in thought of the Halloween. As I stated, Sweden is not into celebrating this time. There are some stuffs for sale around the country but not as what you have in the US and in The Philippines. This is the part I miss a lot. Unfortunately, Swedes have their tradition that they keep for many many years. Hope one day, the adopt the international tradition, now that Sweden is more open to immigrants. Thank you once again Susan for sharing and it makes my life complete, following you. I might not leaving comments every post you have but I and my family is reading your blog everyday. God Bless, lady and have a quiet and blessed weekend. LoL* Sweden is a bit boring when it comes to celebration/tradition. Sometimes, I do my own way and I can see the eyebrows of my neighbours up §:-) Hopefully, Swedes loosen up as they open the country to immigrants and of course they brought their tradition in. Yes, indeed! too big thing even in the Philippines. When I was young, the thing I remember was pray and had family dinner (poor lil one). I thank you once again for hosting. D´Nics send their hugs to you and your lovelies and wishing you all the best. P.S. Susan, I don’t know why, but your today’s post is not on Google? Actually, I find it only via Facebook. Thanks Cecilia! When you say not on Google, do you mean Google+ or do you mean it didn’t arrive via Feedburner in your email Inbox? Let me know…I’m thinking about changing how the emails go out, not sure they are always being delivered. I received mine today but another reader said she didn’t get her email notice that a post was up. Thanks so much for having your sweet linky party for us. I love your Idea These are adorable and thanks for taking the time putting them together for us.. You are a sweet lady. 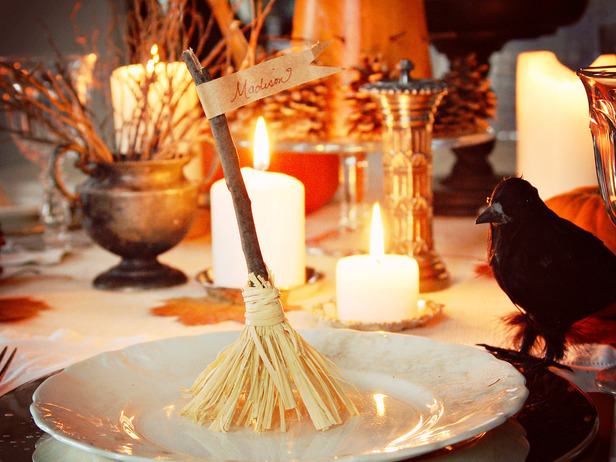 It’s been a long time for me not posting a Tablescape but for now I am back..
Love the little witch brooms! I am going to make them for my table. Really like the part about eating carmel apples for the project. Susan – what a cute project! Of course, mine would never end up looking like yours. I have been trying all day to link up, but could not see your new post. I realized tonight what I had done wrong. After “allowing” your page, I did not “refresh” the page. However, for some reason Firefox really does not want me on your site – not sure what has changed, but I think there are many, many different sites that are trying to “spy” on me from your page. Firefox shows them to me. I have not had this problem previously – yikes! First of all the little broomsticks are as cute as they can be. Now, I did get my notice of your post for today on my G-mail. However, when I googled BNOP earlier it only brought up your post on the 23rd. Even when you hit on home, today’s post did not come up. Also on my blog roll the 23rd came up but not today’s. To get back to today’s post I have to go back to my G-mail. Curious isn’t it? Candy, thanks for that info. I just called and talked to my hosting company because they had made a change yesterday that was supposed to improve the load time for the blog, but apparently it did something with the caching part of the blog. It should be fixed now. Try it again and see if it works. I knew something bad must be wrong if hitting “Home” wasn’t showing you my newest post on top. So glad several folks said something today because it was working fine for me and I would never have known that the change they made was causing that if you and others hadn’t told me about it. They just changed it back so I hope it’s corrected now. Let me know if it isn’t. Thanks again! Glad to hear that you were just having hosting problems as I was afraid that I wasn’t going to have my Susan linky party fix for the day! Very cute brooms and I’m thinking you could reverse the idea and make stand up pine trees for Christmas. Hmmmm. I tried getting back with you last night, but it is still the same this morning. On Google Chrome I open your page and it is still on the Garden Frog and on Explorer, the TT post comes up but won’t open. To contact you I had to go through my dashboard. Strange. Jacqueline, do this and see if it fixes it. Go to my blog and then click Control F5. Let me know if that works. Susan, It’s always so nice to visit your blog and see what you have been up to. 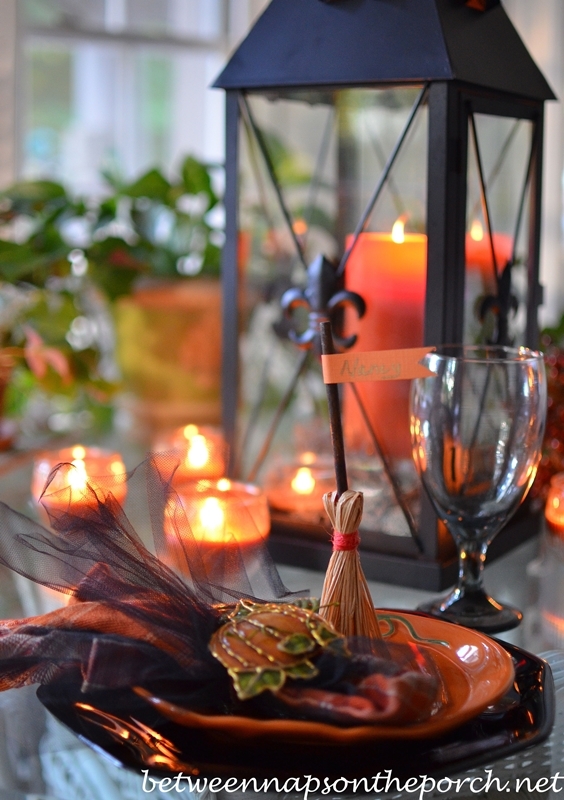 These lil broomstick place card holders are adorable and sure add a october touch to your holiday table. You must have a special kitchen just to hold all of your dishes! WOW! such fun and you have amazing ideas. New to your party, and enjoying looking around your blog. Take care! Susan, I don’t think they have fixed your problem yet. I am pretty sure you probably know that. I just tried to get back to this post on Google and it is still showing the 23rd. I see my comment from yesterday was the last one posted from yesterday or today. I just tried F5 on the page brought up on the Google search and it did not bring up the current post. When I came back to this page I was able to see some new comments and your reply which I did not see when I posted the comment at 7:28. P.S: Would even be cute to use if doing a ‘Fantasia’ themed table. Thanks, Brenda! They would be perfect for that! These are adorable. I just found your blog, well done. Super Halloween table idea!